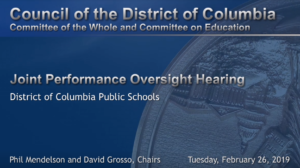 Turnaround for Children’s partnership with District of Columbia Public Schools (DCPS) was highlighted during a joint performance oversight hearing on DCPS held by the Council of the District of Columbia’s Committee of the Whole and Committee on Education on February 26. During the hearing, council member and education committee chair David Grosso inquired about what DCPS is working on to ensure that they can understand the needs of their schools and to build the capacities of teachers and leaders regarding trauma-informed practices. Melissa Kim, Deputy Chancellor of Social, Emotional, and Academic Development, cited DCPS’s work with Turnaround as a key partner, specifically mentioning Turnaround’s SEAT (Schoolwide Environmental Assessment Tool) and the Assistant Principal Community of Practice on Trauma-Informed Practices, supported by Turnaround, as two of the primary strategies the district is employing to meet these key needs.